Hey your eyes are pointed at words I wrote! I hope you’re having a splendid 2014. So far this year I’ve been mostly sequestered away working on Scambot 2, although I did guest with Joe Travers and Friends at the Potato one night, which was beyond beyond, and I had a scintillating detour to The Iridium in NYC for a couple of nights with the Ed Palermo Big Band and Napoleon Murphy Brock – intensely fun and severely musical. And did I mention how much I loved playing those four shows with Bryan, Joe and Rick in December? I adore those goofballs, the shows were great and I want to thank everyone who came to see us. It was necessary for me to get out and play some songs from You Must Be This Tall live for the first time, and it was also great to bust out tunes from the recently reissued Sluggo!. Speaking of which: the response to the Sluggo! reissue has been crazy. I definitely felt we were taking a risk remixing one of my albums for the first time – the “messing with peoples’ memories” angle is definitely something that has to be considered. And I’ve heard too many remixes of albums where it was considered some form of victory for it merely to not sound way worse than the original. We were shooting for way more with Sluggo! We worked for a long time on the stereo and surround remixes (as long as it’s taken me to make some albums from scratch) and we took the process very seriously. After it was done I was utterly convinced that we had improved the sound of the record hugely, and with all the supplementary audio and video material we gathered for the new edition I was certain that we’d created a really nice package – now we had to see what everyone else thought of it all. So it’s been gratifying that every bit of feedback we’ve gotten, and every comment we’ve seen online, supports our belief that the remix is a genuine improvement. I seriously haven’t seen a single negative comment, which is stunning. The response to the surround mix has also justified the time and hard work spent on it, and people are enjoying the vast quantity of archival video and bonus audio contained in the deluxe package. I couldn’t be more happy about it all. And this review on the Something Else Reviews website. There are still a good batch of Super Deluxe Editions available, but they’re going pretty dang quick. That’s the signed numbered edition of 1000, which comes with the additional CD Live At Mama Kin in its own digipak. This is a burning Beer For Dolphins gig from 1998, and it also features superb audio quality. Speaking of underwater, I’ve been obsessed with the show Sea Hunt lately. It is absolutely fantastic. More about that, perhaps, in the next exciting installment of THE KENEALLIST! 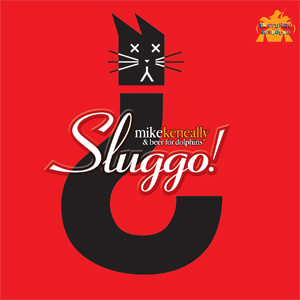 Listen to “Sluggomatic,” A Brief Tour of Mike Keneally’s Sluggo!Order Sluggo! today at The Mike Keneally Store. You’ll get the stereo download NOW, and your multi-disc Sluggo! package will ship right away. Order today at The Mike Keneally Store. You’ll get the stereo download NOW, and your multi-disc Sluggo! package will ship right away. Ed Palermo Big BandJoe Travers and FriendsNapoleon Murphy BrockScambot 2Sluggo!